1. 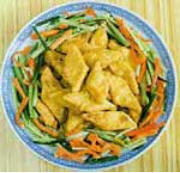 Cut the bean curd into 1/4 inch (6 mm) diamonds. Spread on a dish sprinkle with the scallions, ginger, MSG, salt, and rice wine. Let marinate. Beat the eggs. 2. Heat the oil in a wok to about 210oF(100oC), or until small bubbles just appear around a piece of scallion green or ginger when tossed into the oil. Dip the bean curd into the flour and then into the egg. Add to the oil a few pieces at a time. Deep-fry until brown. Remove and drain well. Place in a dish. Garnish with cooked green leaves and serve. More delicious tofu/bean curd recipes are available in ChineseFoodDIY's cookbook "Real & Healthy Chinese Cooking".